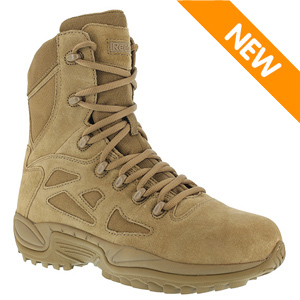 Newly released for the Army's new battle uniform, the OCP ACU, the Reebok RB8977 Men's Rapid Response OCP ACU Coyote Brown Military Boot is a proven boot with a reputation of durability and comfort. Nicknamed the "moon boot", the Reebok Rapid Response series features heavily padded uppers for maximum foot and ankle protection in the field. Reebok's dual density EVA cushion midsole is the same performance midsole featured in many of their athletic shoes for max comfort during long rucks of at the end of extended duty shifts.